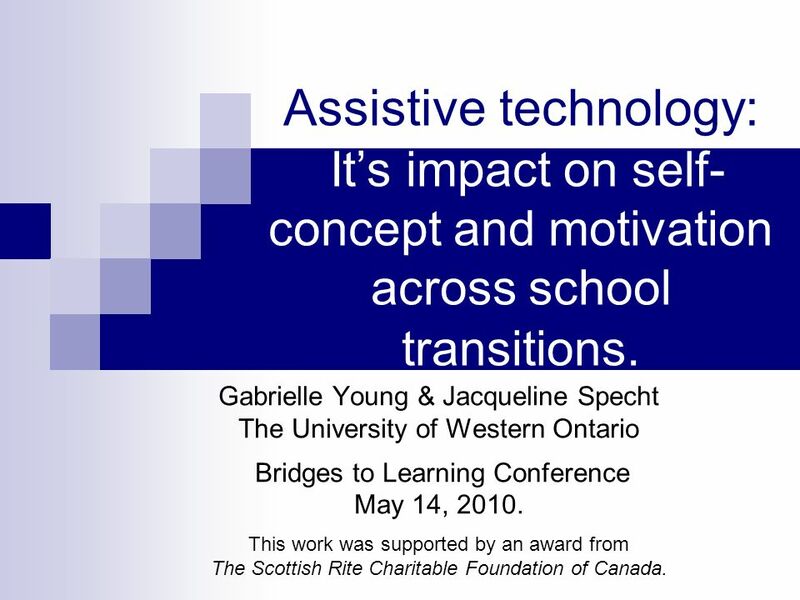 Assistive technology: Its impact on self- concept and motivation across school transitions. Gabrielle Young & Jacqueline Specht The University of Western. 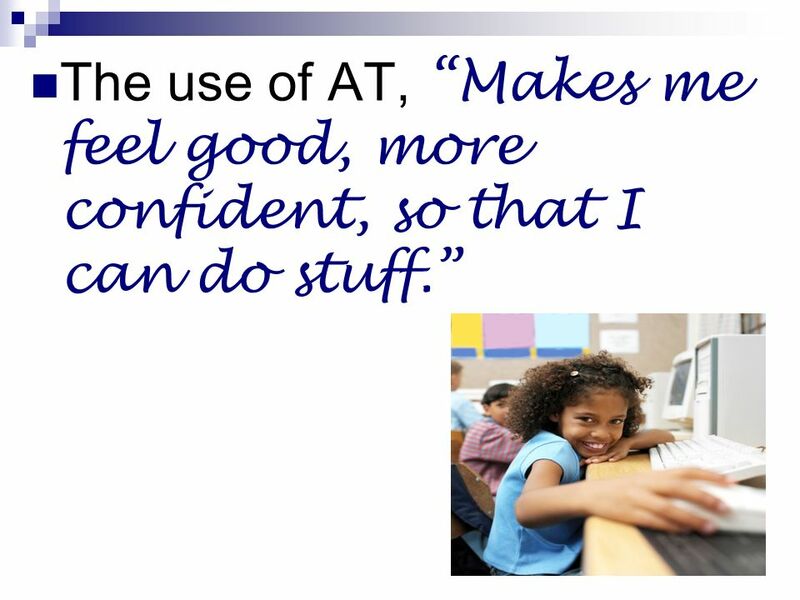 1 Assistive technology: Its impact on self- concept and motivation across school transitions. Gabrielle Young & Jacqueline Specht The University of Western Ontario Bridges to Learning Conference May 14, 2010. This work was supported by an award from The Scottish Rite Charitable Foundation of Canada. 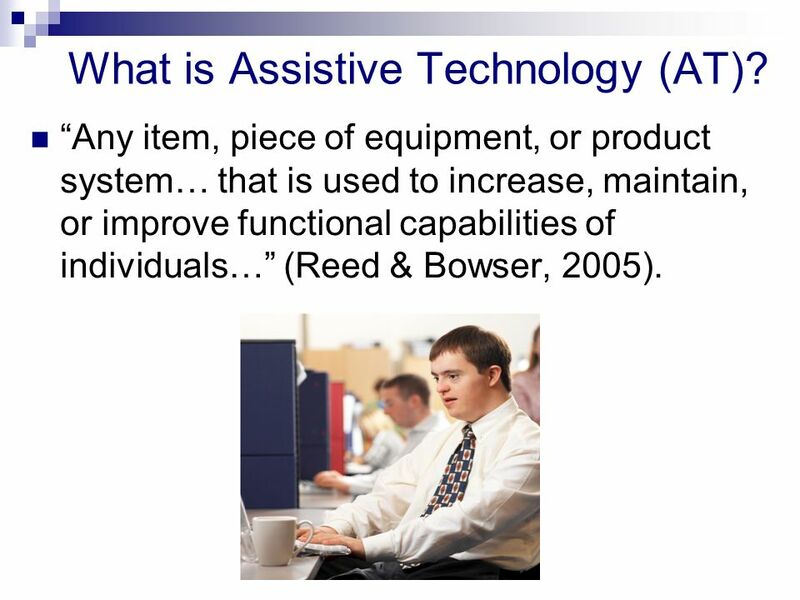 2 What is Assistive Technology (AT)? Any item, piece of equipment, or product system… that is used to increase, maintain, or improve functional capabilities of individuals… (Reed & Bowser, 2005). 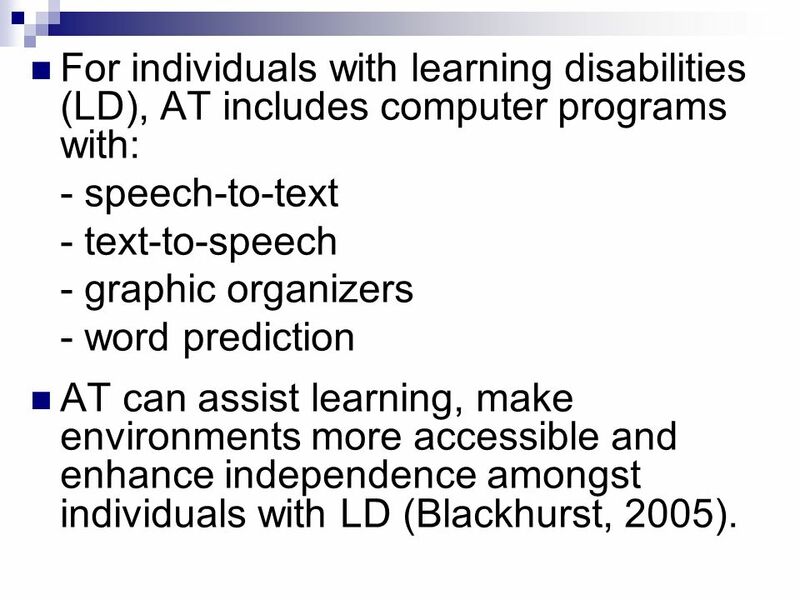 3 For individuals with learning disabilities (LD), AT includes computer programs with: - speech-to-text - text-to-speech - graphic organizers - word prediction AT can assist learning, make environments more accessible and enhance independence amongst individuals with LD (Blackhurst, 2005). 5 Why Use Assistive Technology? AT can remediate the reading, spelling, and writing deficits of children with LD (Fasting, & Halaas Lyster, 2005; Hall, Hughes, & Filbert, 2000; Hetzroni, & Shrieber, 2004; Lange, McPhillips, Mulhern, & Wylie, 2006). AT provides students with: - independent access to curriculum - the opportunity to develop compensatory skills - the means to balance weak areas of learning with strong areas. 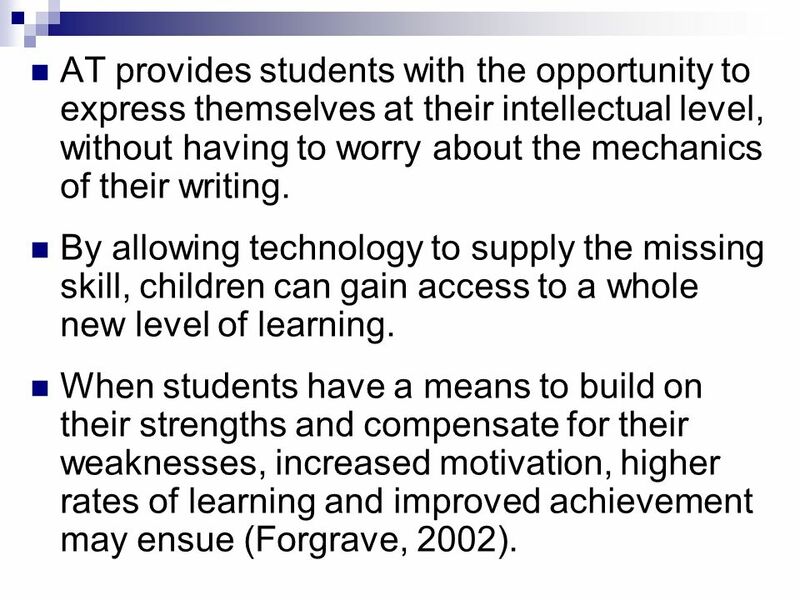 As students learn to use AT, it may improve their reading and writing abilities in all content areas (Bryant, et al., 1998; Forgrave, 2002; MacArthur, 2000). 6 AT provides students with the opportunity to express themselves at their intellectual level, without having to worry about the mechanics of their writing. By allowing technology to supply the missing skill, children can gain access to a whole new level of learning. When students have a means to build on their strengths and compensate for their weaknesses, increased motivation, higher rates of learning and improved achievement may ensue (Forgrave, 2002). 7 BUT… It is recognized that providing technology does not ensure its successful use. 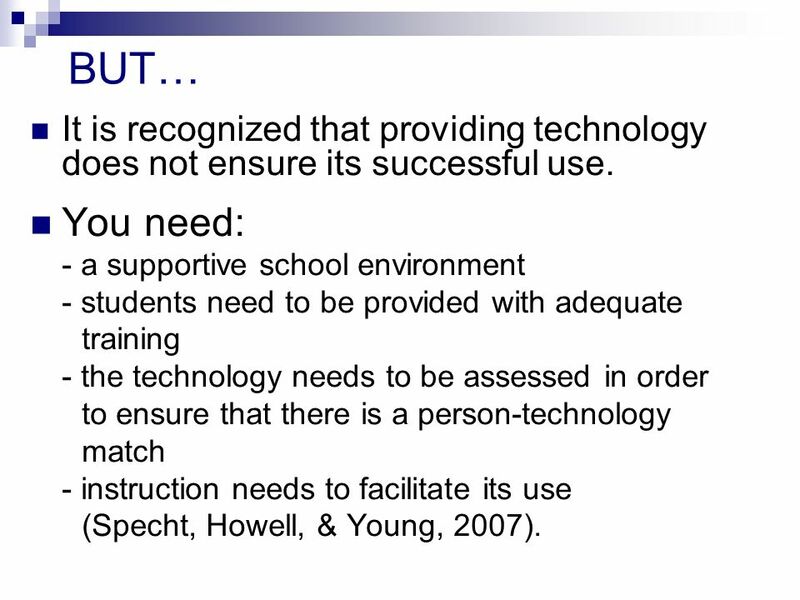 You need: - a supportive school environment - students need to be provided with adequate training - the technology needs to be assessed in order to ensure that there is a person-technology match - instruction needs to facilitate its use (Specht, Howell, & Young, 2007). 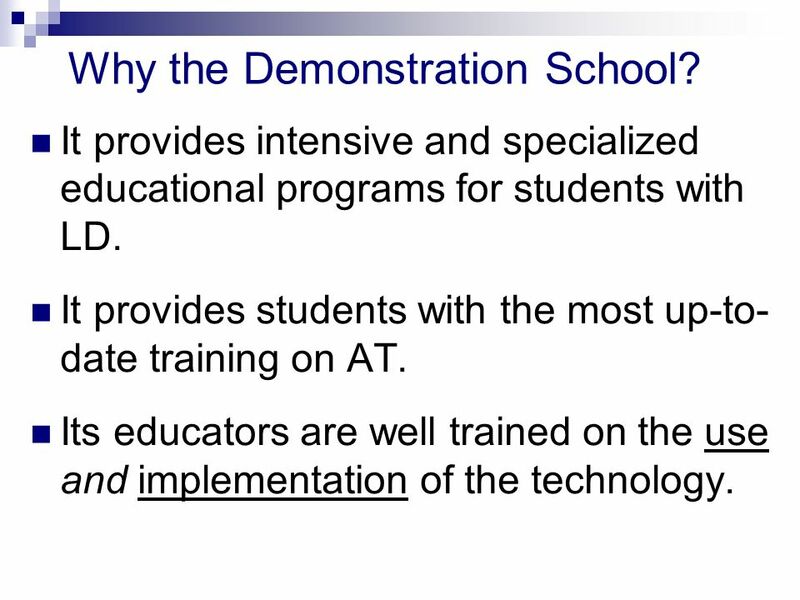 8 Why the Demonstration School? It provides intensive and specialized educational programs for students with LD. It provides students with the most up-to- date training on AT. Its educators are well trained on the use and implementation of the technology. 9 Why conduct these studies? 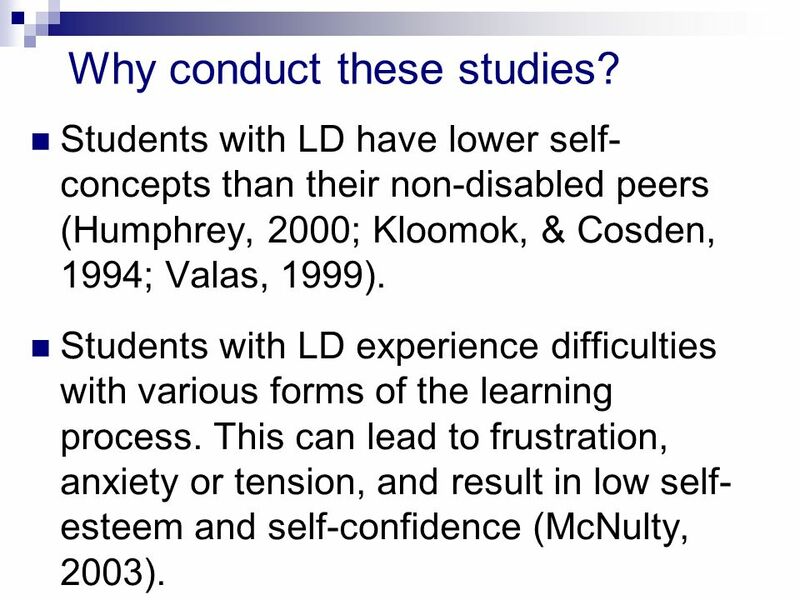 Students with LD have lower self- concepts than their non-disabled peers (Humphrey, 2000; Kloomok, & Cosden, 1994; Valas, 1999). 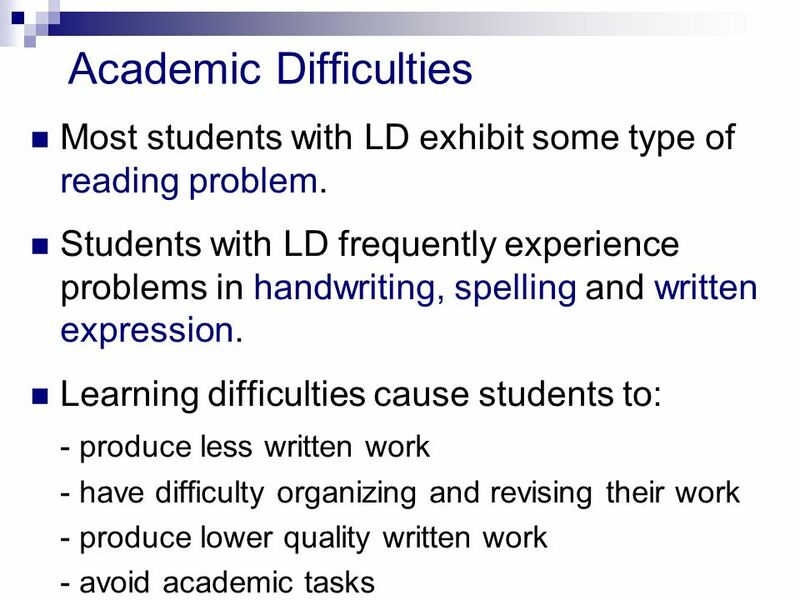 Students with LD experience difficulties with various forms of the learning process. This can lead to frustration, anxiety or tension, and result in low self- esteem and self-confidence (McNulty, 2003). 10 Academic Self-Concept Children with LD recognize the critical importance of academic achievement (Elbaum, & Vaughn, 2003). 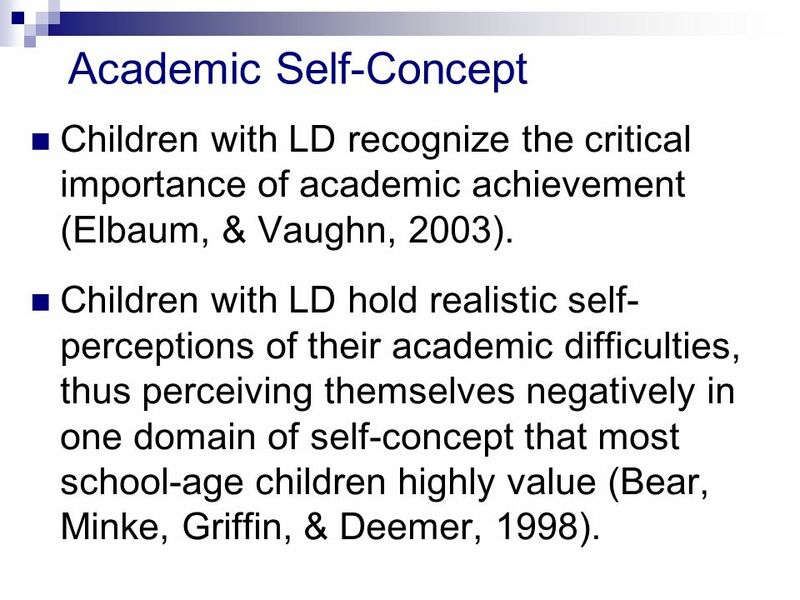 Children with LD hold realistic self- perceptions of their academic difficulties, thus perceiving themselves negatively in one domain of self-concept that most school-age children highly value (Bear, Minke, Griffin, & Deemer, 1998). 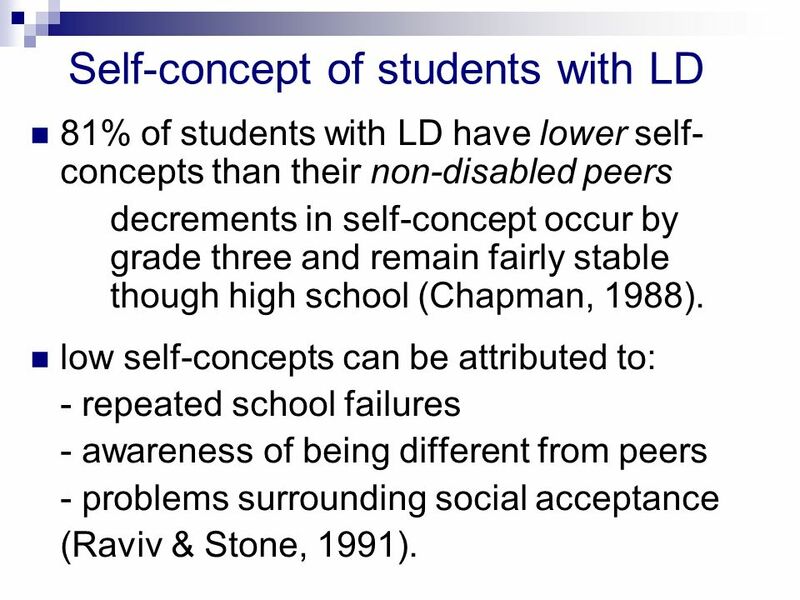 11 Self-concept of students with LD 81% of students with LD have lower self- concepts than their non-disabled peers decrements in self-concept occur by grade three and remain fairly stable though high school (Chapman, 1988). low self-concepts can be attributed to: - repeated school failures - awareness of being different from peers - problems surrounding social acceptance (Raviv & Stone, 1991). 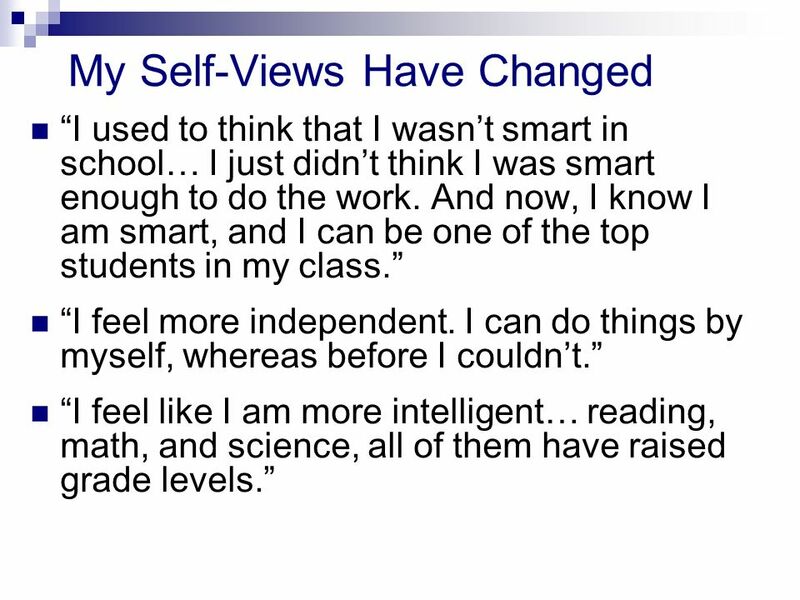 12 Importance of Academic Self-Concept The development of a positive academic self-concept is essential to the learning process, but this positive sense of self is not always found amongst students with LD. 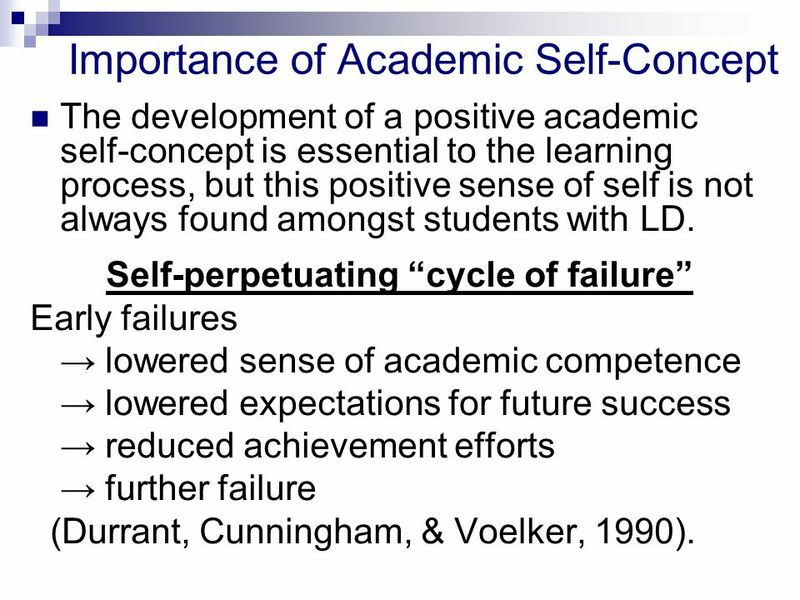 Self-perpetuating cycle of failure Early failures lowered sense of academic competence lowered expectations for future success reduced achievement efforts further failure (Durrant, Cunningham, & Voelker, 1990). 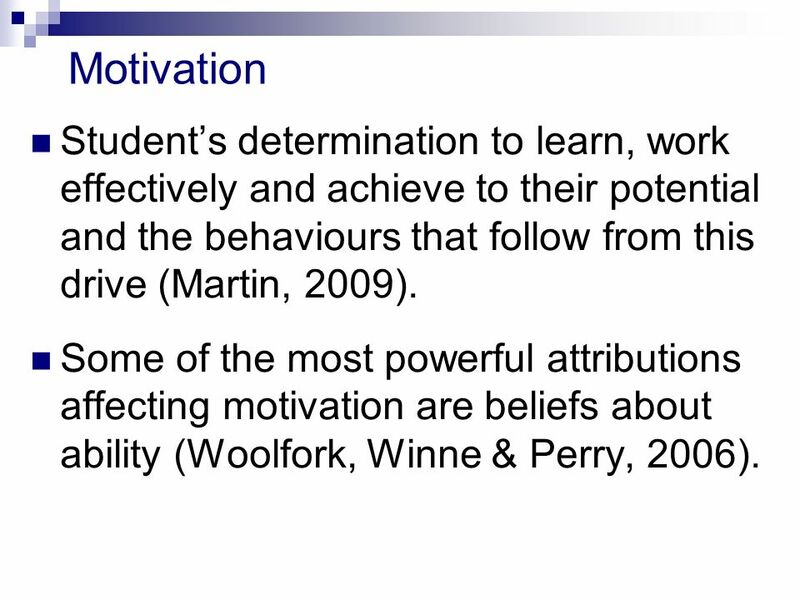 13 Motivation Students determination to learn, work effectively and achieve to their potential and the behaviours that follow from this drive (Martin, 2009). Some of the most powerful attributions affecting motivation are beliefs about ability (Woolfork, Winne & Perry, 2006). 14 Why are these studies important? Research has been conducted on the effect of AT on academic achievement. Research has been conducted on the self- esteem of individuals with LD. 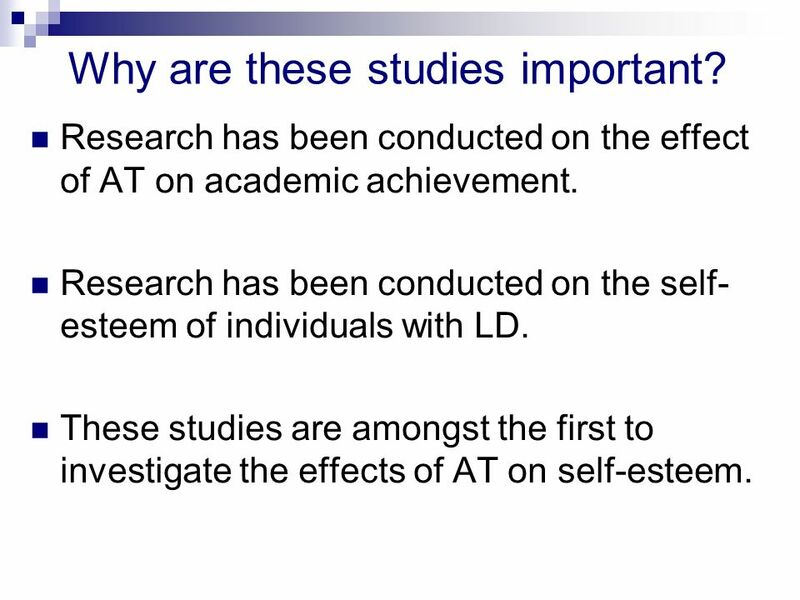 These studies are amongst the first to investigate the effects of AT on self-esteem. 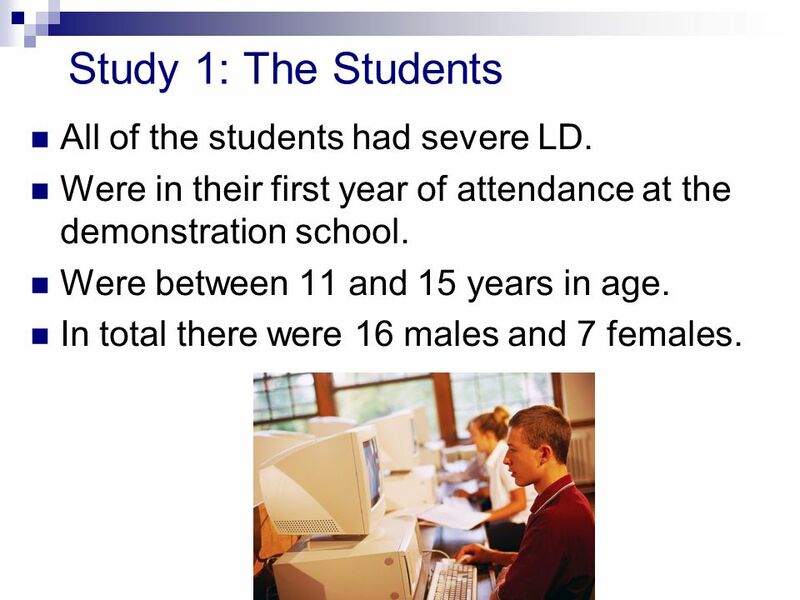 15 Study 1: The Students All of the students had severe LD. Were in their first year of attendance at the demonstration school. Were between 11 and 15 years in age. In total there were 16 males and 7 females. 16 The Interviews Open-ended interviews were conducted with each of the students. The interviews were transcribed, and the researcher worked with a critical friend to look for emerging themes in the transcripts. The themes were used to develop a coding system. 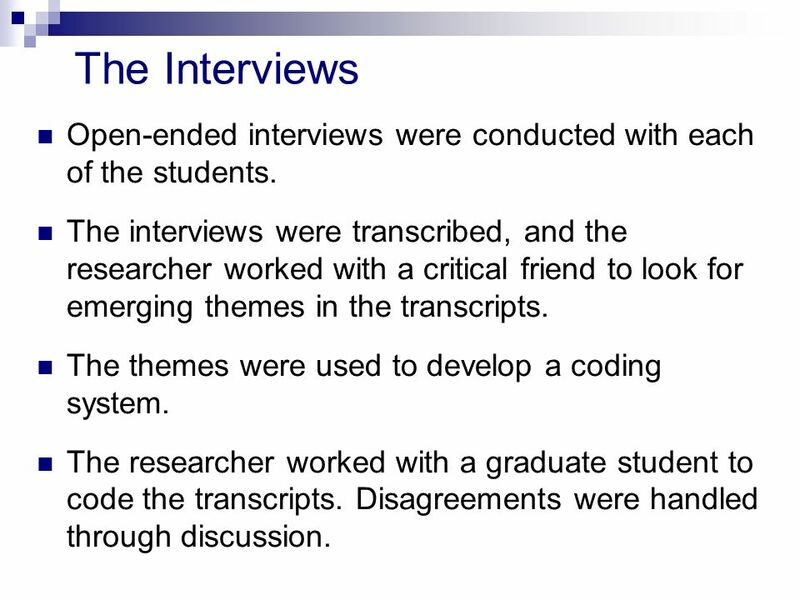 The researcher worked with a graduate student to code the transcripts. Disagreements were handled through discussion. 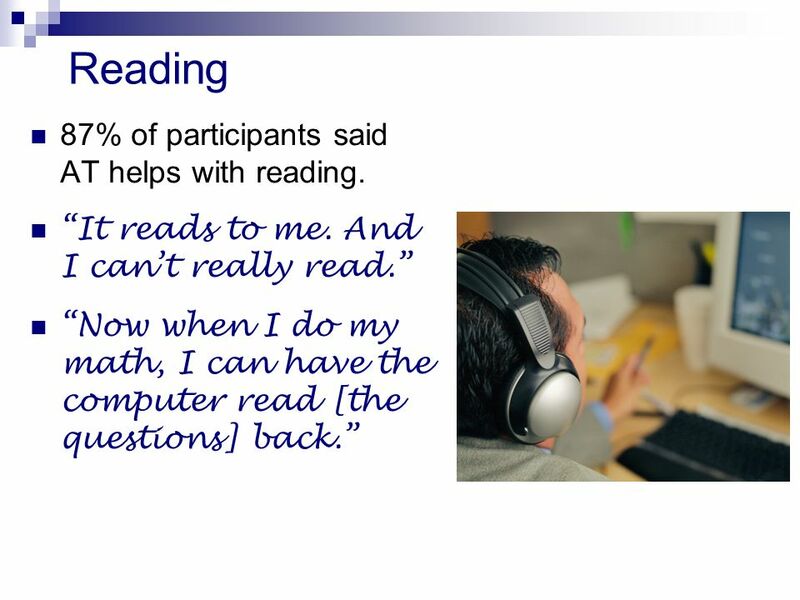 17 Reading 87% of participants said AT helps with reading. It reads to me. And I cant really read. Now when I do my math, I can have the computer read [the questions] back. 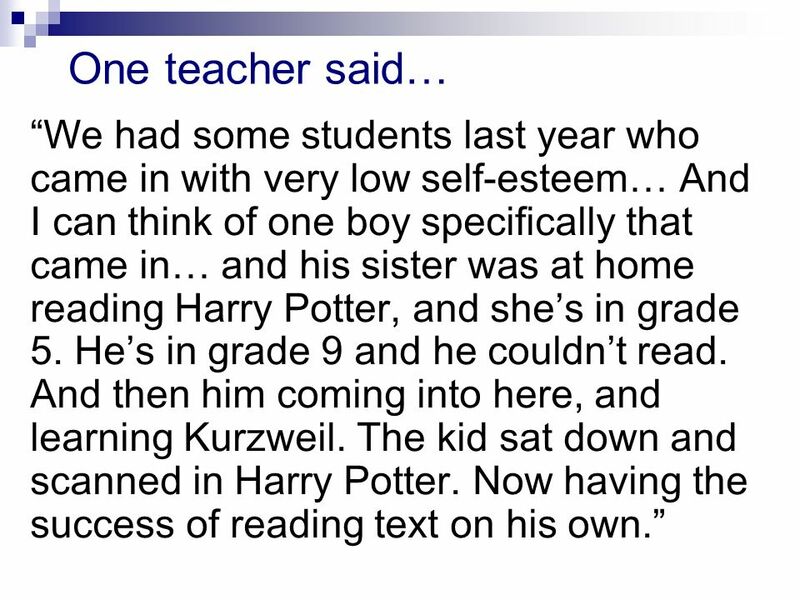 18 One teacher said… We had some students last year who came in with very low self-esteem… And I can think of one boy specifically that came in… and his sister was at home reading Harry Potter, and shes in grade 5. Hes in grade 9 and he couldnt read. And then him coming into here, and learning Kurzweil. The kid sat down and scanned in Harry Potter. Now having the success of reading text on his own. 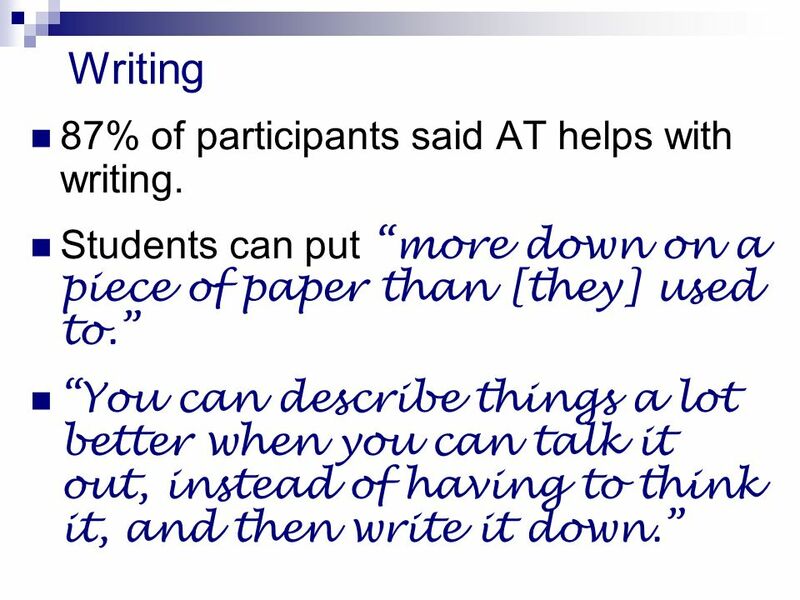 19 Writing 87% of participants said AT helps with writing. Students can put more down on a piece of paper than [they] used to. You can describe things a lot better when you can talk it out, instead of having to think it, and then write it down. 20 75% of participants noted that it is easier to do school work with the use of AT. 65% of participants prefer using the technology because it helps them get their work done faster. The AT is extremely helpful. Without it I would be like last year. Never on top of my homework, it piles up, and I would be doing it for hours and hours. 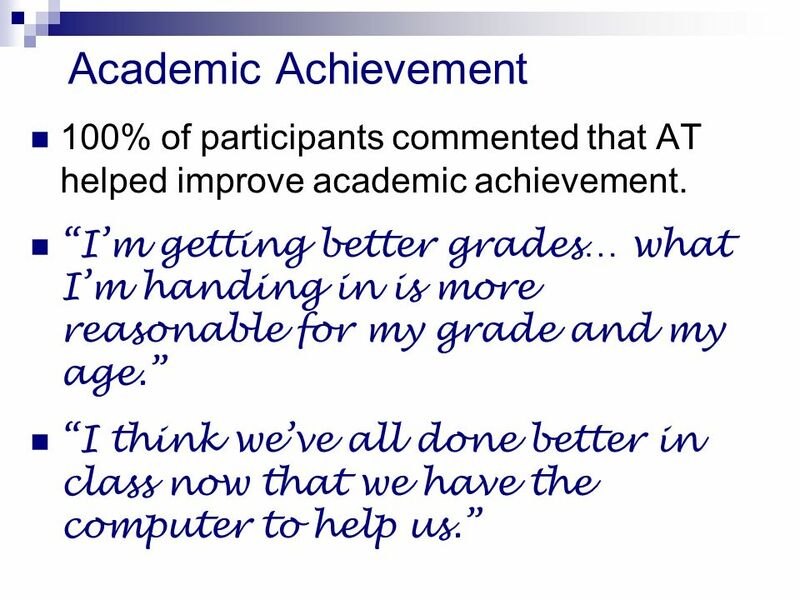 21 Academic Achievement 100% of participants commented that AT helped improve academic achievement. Im getting better grades… what Im handing in is more reasonable for my grade and my age. I think weve all done better in class now that we have the computer to help us. 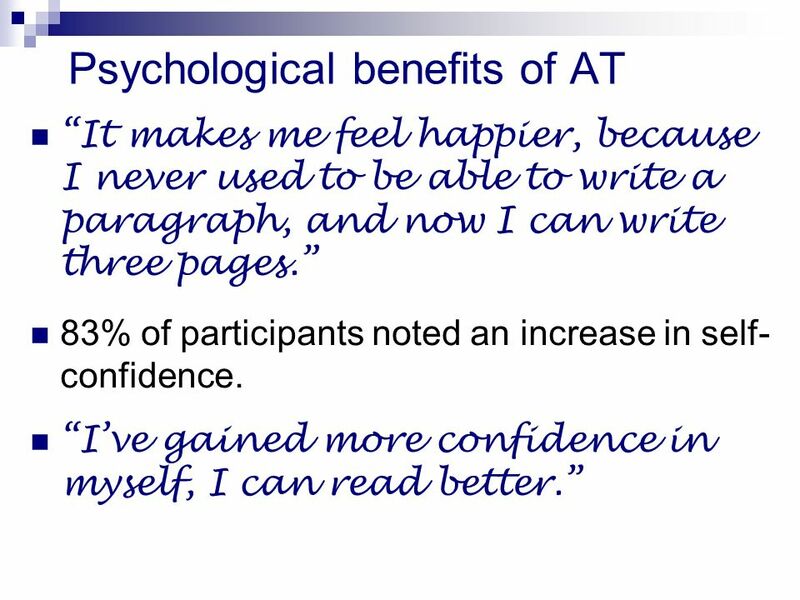 22 Psychological benefits of AT It makes me feel happier, because I never used to be able to write a paragraph, and now I can write three pages. 83% of participants noted an increase in self- confidence. Ive gained more confidence in myself, I can read better. 23 The use of AT, Makes me feel good, more confident, so that I can do stuff. 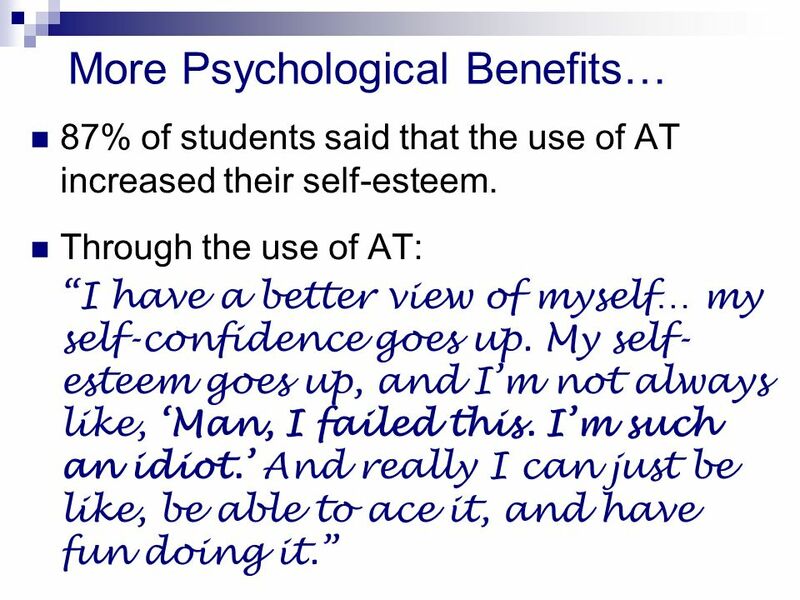 24 More Psychological Benefits… 87% of students said that the use of AT increased their self-esteem. Through the use of AT: I have a better view of myself… my self-confidence goes up. My self- esteem goes up, and Im not always like, Man, I failed this. Im such an idiot. And really I can just be like, be able to ace it, and have fun doing it. 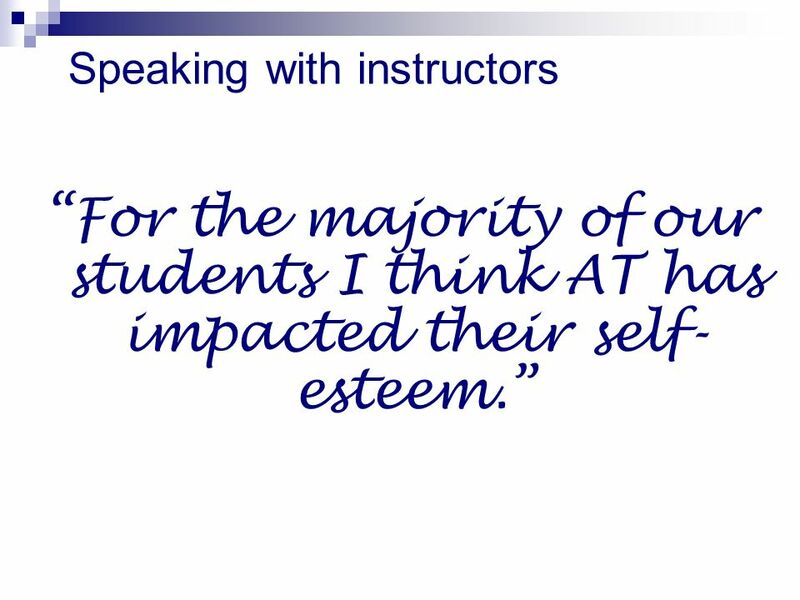 25 Speaking with instructors For the majority of our students I think AT has impacted their self- esteem. 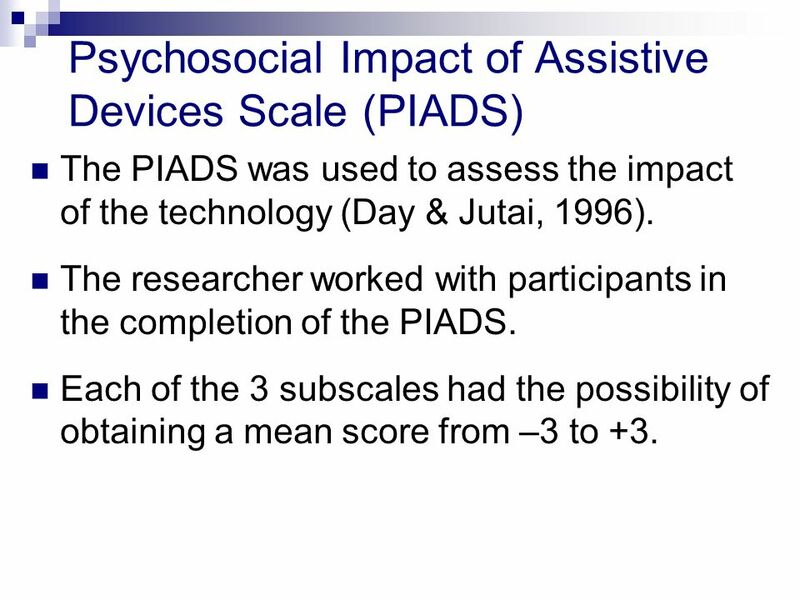 26 Psychosocial Impact of Assistive Devices Scale (PIADS) The PIADS was used to assess the impact of the technology (Day & Jutai, 1996). The researcher worked with participants in the completion of the PIADS. Each of the 3 subscales had the possibility of obtaining a mean score from –3 to +3. 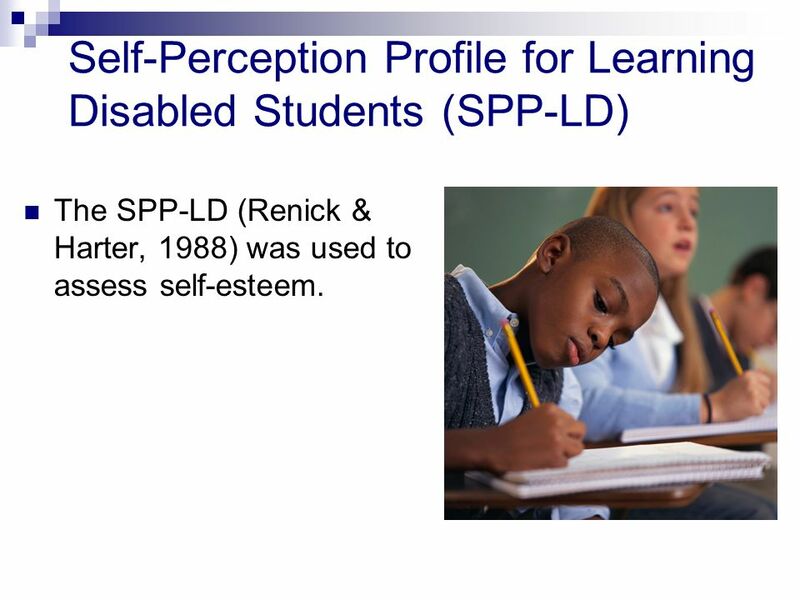 28 Self-Perception Profile for Learning Disabled Students (SPP-LD) The SPP-LD (Renick & Harter, 1988) was used to assess self-esteem. 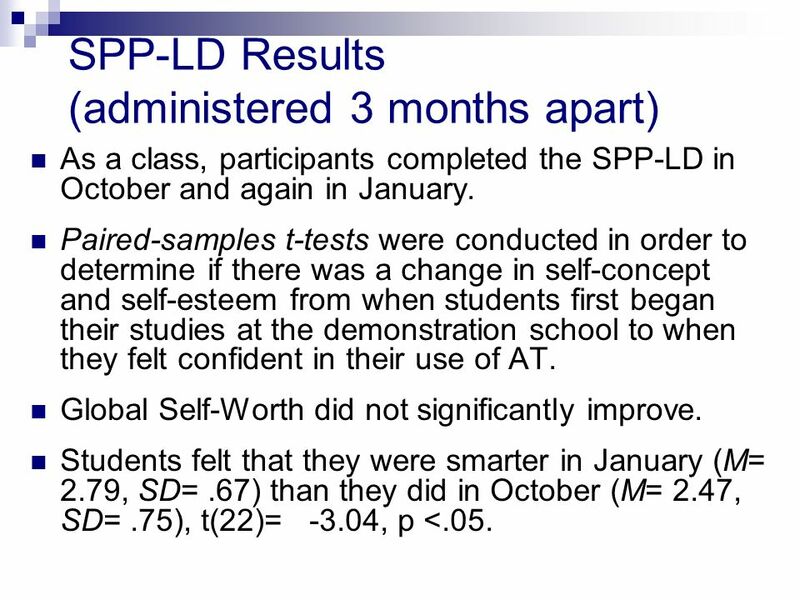 29 SPP-LD Results (administered 3 months apart) As a class, participants completed the SPP-LD in October and again in January. Paired-samples t-tests were conducted in order to determine if there was a change in self-concept and self-esteem from when students first began their studies at the demonstration school to when they felt confident in their use of AT. Global Self-Worth did not significantly improve. Students felt that they were smarter in January (M= 2.79, SD=.67) than they did in October (M= 2.47, SD=.75), t(22)= -3.04, p <.05. 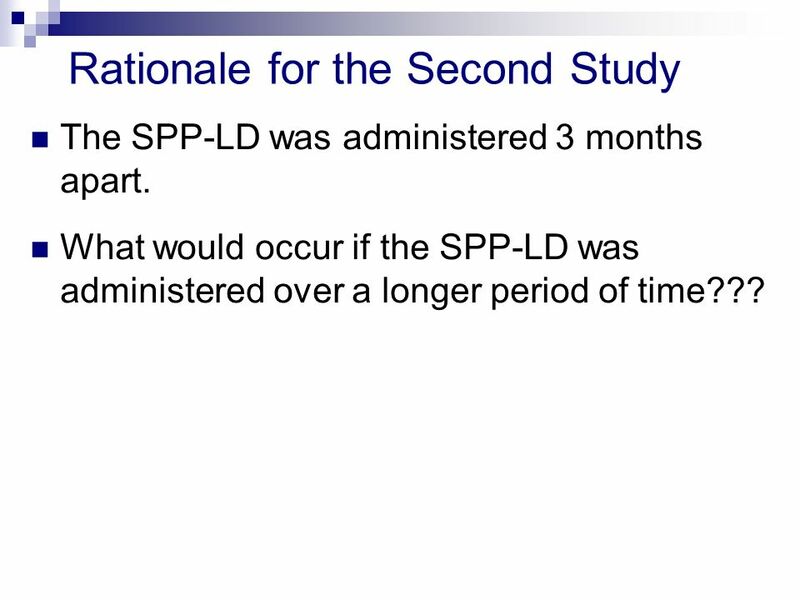 30 Rationale for the Second Study The SPP-LD was administered 3 months apart. What would occur if the SPP-LD was administered over a longer period of time??? 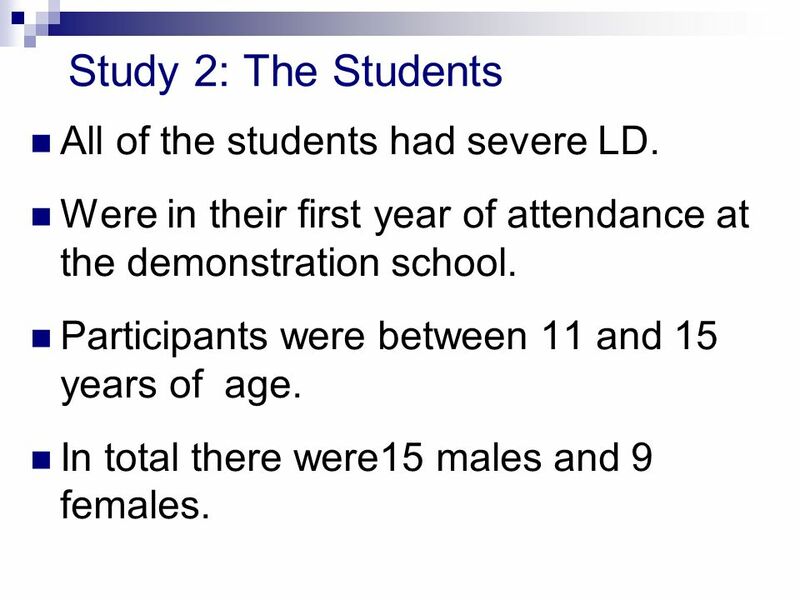 31 Study 2: The Students All of the students had severe LD. Were in their first year of attendance at the demonstration school. Participants were between 11 and 15 years of age. In total there were15 males and 9 females. 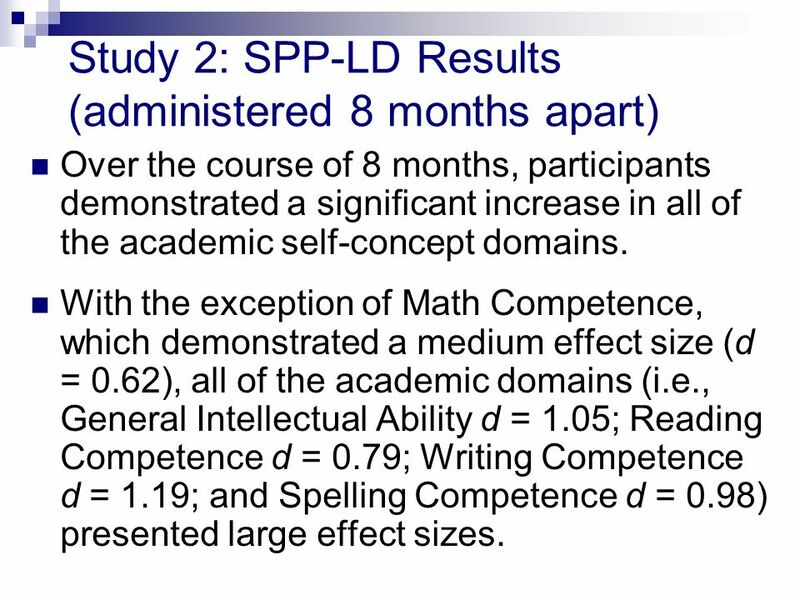 32 Study 2: SPP-LD Results (administered 8 months apart) Over the course of 8 months, participants demonstrated a significant increase in all of the academic self-concept domains. 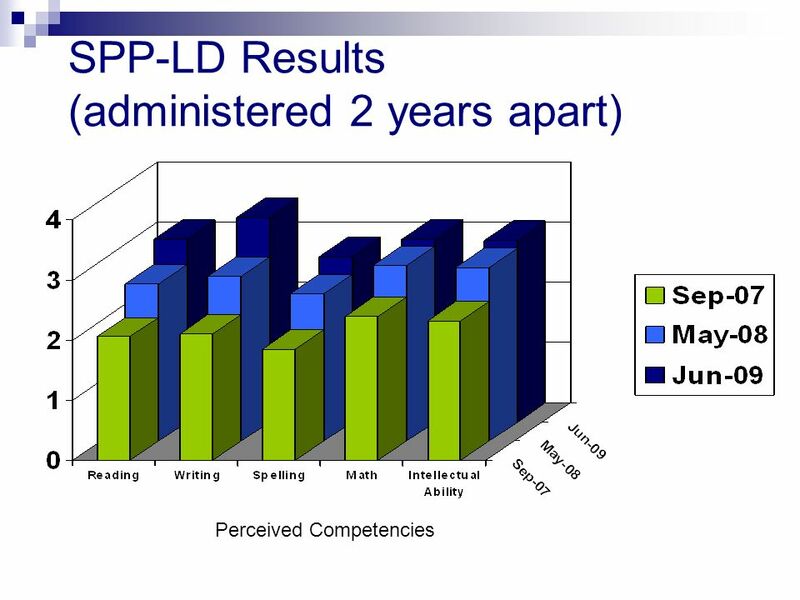 With the exception of Math Competence, which demonstrated a medium effect size (d = 0.62), all of the academic domains (i.e., General Intellectual Ability d = 1.05; Reading Competence d = 0.79; Writing Competence d = 1.19; and Spelling Competence d = 0.98) presented large effect sizes. 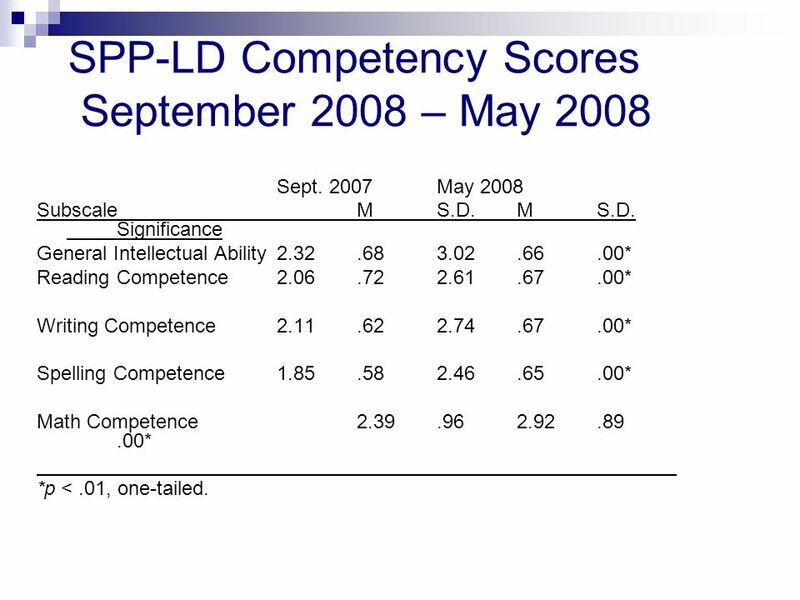 33 SPP-LD Competency Scores September 2008 – May 2008 Sept. 2007May 2008 SubscaleMS.D.MS.D. Significance General Intellectual Ability2.32.683.02.66.00* Reading Competence2.06.722.61.67.00* Writing Competence2.11.622.74.67.00* Spelling Competence1.85.582.46.65.00* Math Competence2.39.962.92.89.00* *p <.01, one-tailed. 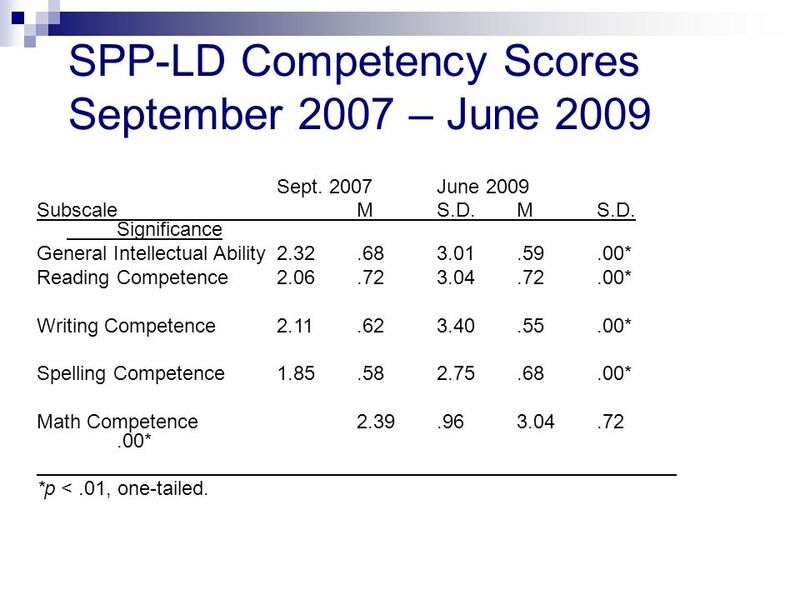 35 SPP-LD Competency Scores September 2007 – June 2009 Sept. 2007June 2009 SubscaleMS.D.MS.D. Significance General Intellectual Ability2.32.683.01.59.00* Reading Competence2.06.723.04.72.00* Writing Competence2.11.623.40.55.00* Spelling Competence1.85.582.75.68.00* Math Competence2.39.963.04.72.00* *p <.01, one-tailed. 37 Rationale for the Third Study Want to better understand the degree to which students continue to use AT and how they are coping and performing in their local high schools. Want to understand how AT may influence self-concept and school motivation. 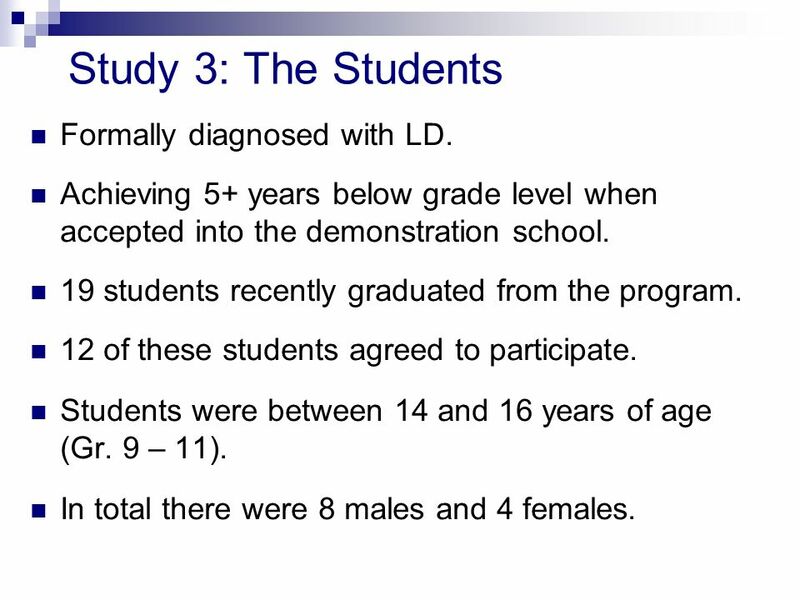 38 Study 3: The Students Formally diagnosed with LD. Achieving 5+ years below grade level when accepted into the demonstration school. 19 students recently graduated from the program. 12 of these students agreed to participate. Students were between 14 and 16 years of age (Gr. 9 – 11). In total there were 8 males and 4 females. 39 AT - Likes / Dislikes I love it, I use it everyday… Its easier and I dont have to worry about, Well, I dont think I can do that. I just have to go and get my computer and I can do it. It just makes everything so much easier. It helps me cause if it wasnt for AT, I couldnt understand my work… If I have to read a story and then answer short answer questions, it can read it to me. I can go back use the highlight tools, and then I can use Dragon to answer the questions. 40 AT Makes Work Easier For projects, if I have to research stuff on the internet, I dont have to struggle reading through it, I can just use Kurzweil to read it. And if its a test, it takes longer for me to write something that it does for me to say it. 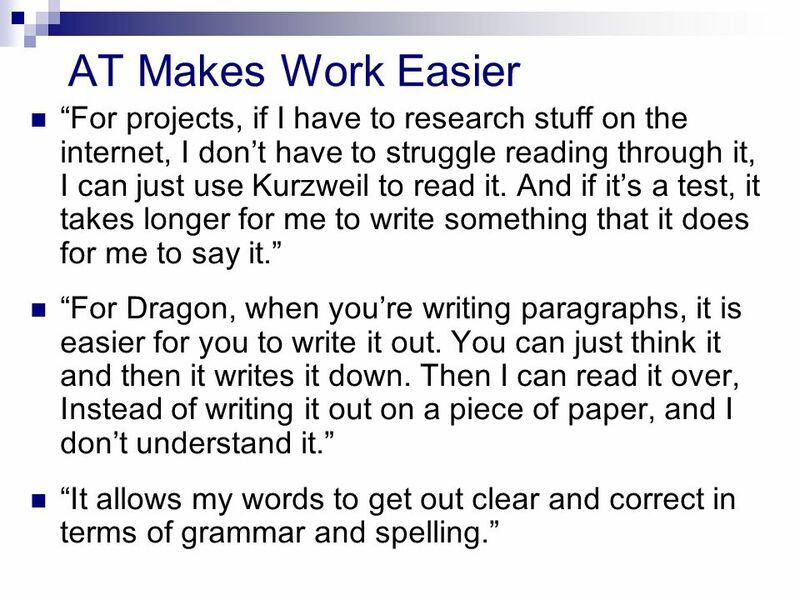 For Dragon, when youre writing paragraphs, it is easier for you to write it out. You can just think it and then it writes it down. Then I can read it over, Instead of writing it out on a piece of paper, and I dont understand it. It allows my words to get out clear and correct in terms of grammar and spelling. 41 AT Makes Work Faster My English exam, I think I can get it done in an hour because I will have the answers already in my head, and I dont have to figure out words to write it, I can just say it. 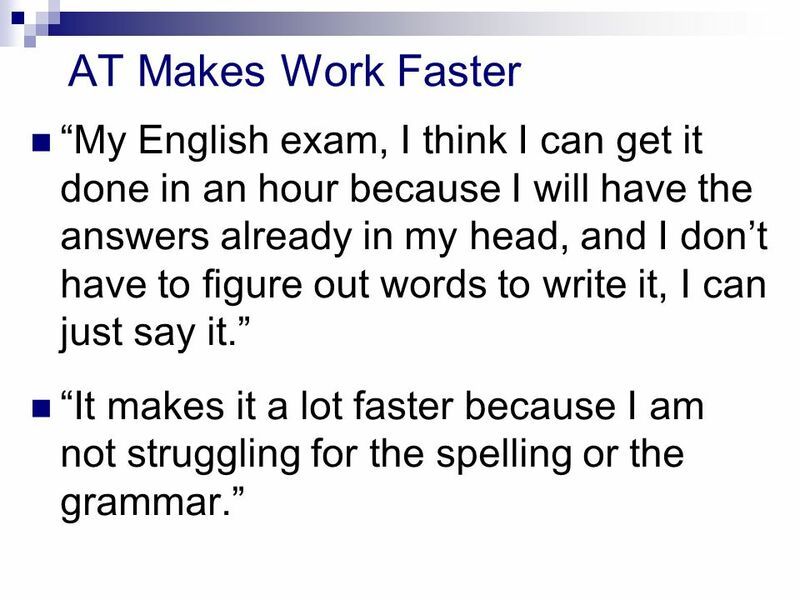 It makes it a lot faster because I am not struggling for the spelling or the grammar. 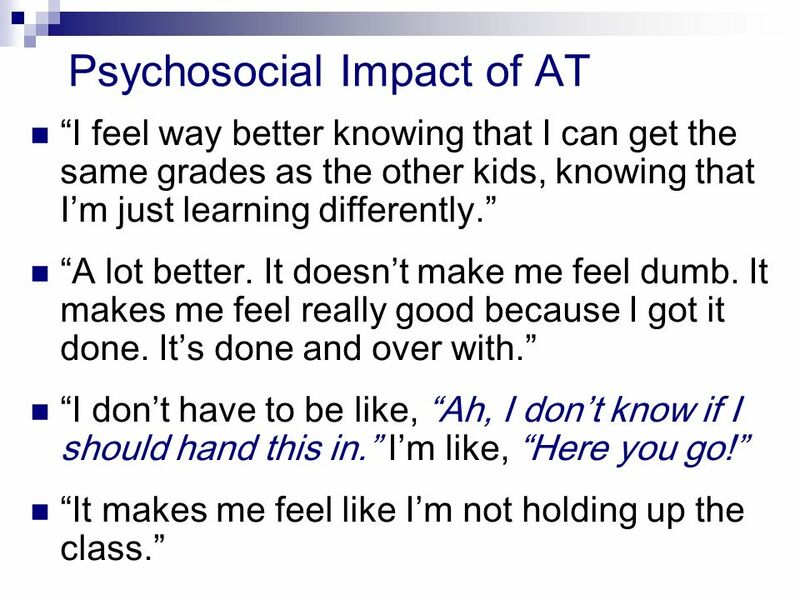 42 Psychosocial Impact of AT I feel way better knowing that I can get the same grades as the other kids, knowing that Im just learning differently. A lot better. It doesnt make me feel dumb. It makes me feel really good because I got it done. Its done and over with. I dont have to be like, Ah, I dont know if I should hand this in. Im like, Here you go! It makes me feel like Im not holding up the class. 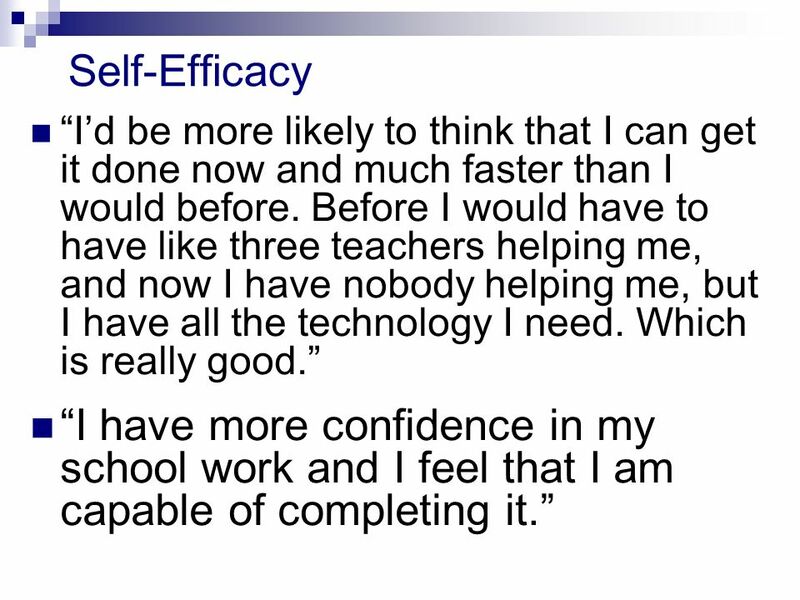 43 Self-Efficacy Id be more likely to think that I can get it done now and much faster than I would before. Before I would have to have like three teachers helping me, and now I have nobody helping me, but I have all the technology I need. Which is really good. I have more confidence in my school work and I feel that I am capable of completing it. 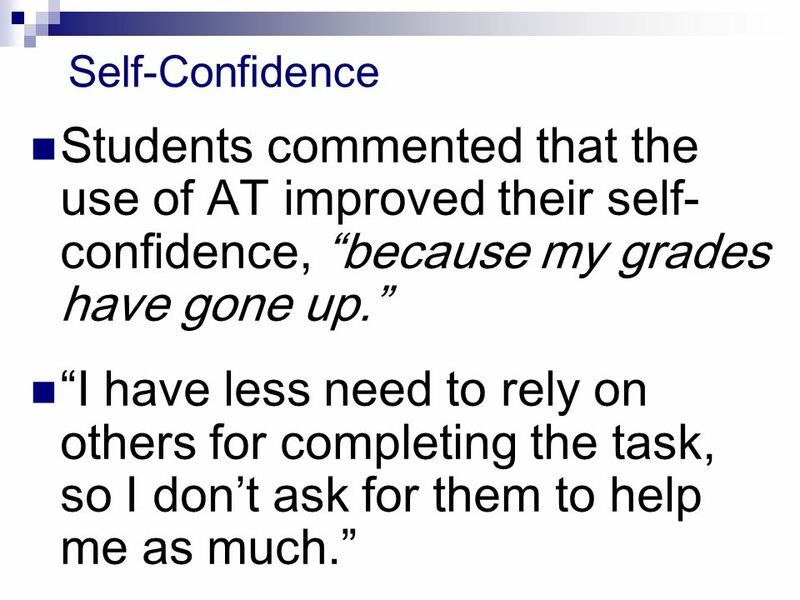 44 Self-Confidence Students commented that the use of AT improved their self- confidence, because my grades have gone up. I have less need to rely on others for completing the task, so I dont ask for them to help me as much. 45 My Self-Views Have Changed I used to think that I wasnt smart in school… I just didnt think I was smart enough to do the work. And now, I know I am smart, and I can be one of the top students in my class. I feel more independent. I can do things by myself, whereas before I couldnt. I feel like I am more intelligent… reading, math, and science, all of them have raised grade levels. 46 Self-Esteem Before Id get frustrated and Id need sports to get me through the day. But now being at [the demonstration school], learning different technology, different ways, its easy. 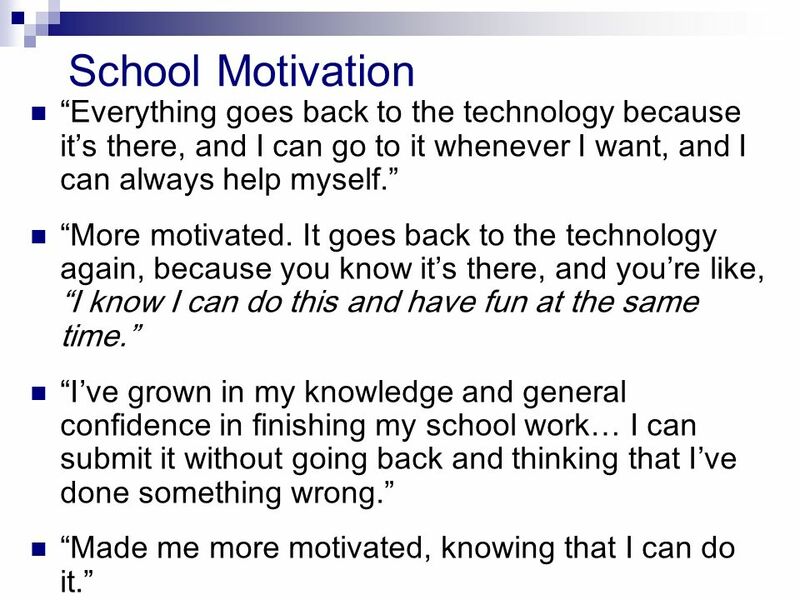 47 School Motivation Everything goes back to the technology because its there, and I can go to it whenever I want, and I can always help myself. More motivated. It goes back to the technology again, because you know its there, and youre like, I know I can do this and have fun at the same time. Ive grown in my knowledge and general confidence in finishing my school work… I can submit it without going back and thinking that Ive done something wrong. Made me more motivated, knowing that I can do it. 48 Any Questions or Comments? 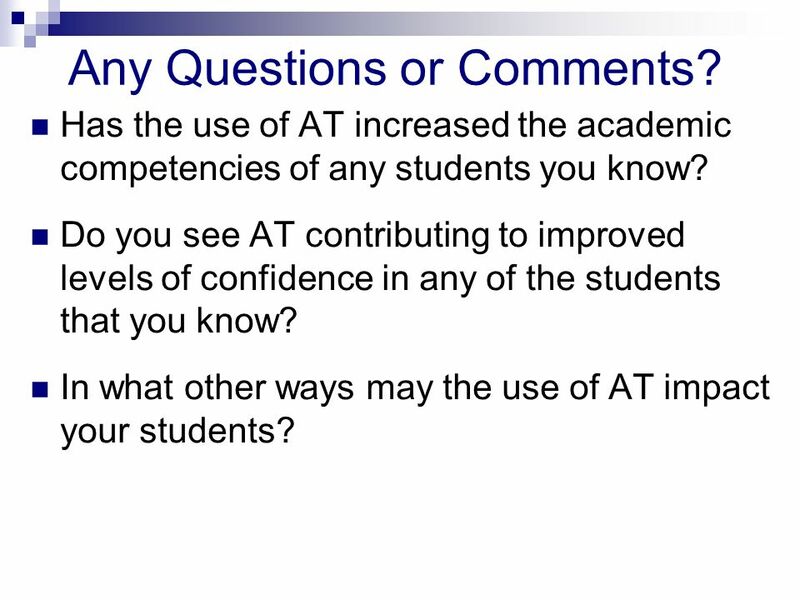 Has the use of AT increased the academic competencies of any students you know? Do you see AT contributing to improved levels of confidence in any of the students that you know? In what other ways may the use of AT impact your students? 49 References Bear, G. G., Minke, K. M., Griffin, S. M., & Deemer, S. A. (1998). Achievement-related perceptions of children with learning disabilities and normal achievement: Group and developmental differences. Journal of Learning Disabilities, 31(1), 91-104. Blackhurst, A. E. (2005). Perspectives on applications of technology in the field of learning disabilities. Learning Disability Quarterly, 28(2), 175-178. Bryant, D., Bryant, B.R., & Raskind, M.H. (1998). Using assistive technology to enhance the skills of students with learning disabilities. Intervention in School and Clinic, 34(1), 53-58. Chapman, J. W. (1988). Learning disabled childrens self-concepts. Review of Educational Research, 58, 347-371. Day, H. I., & Jutai, J. (1996). 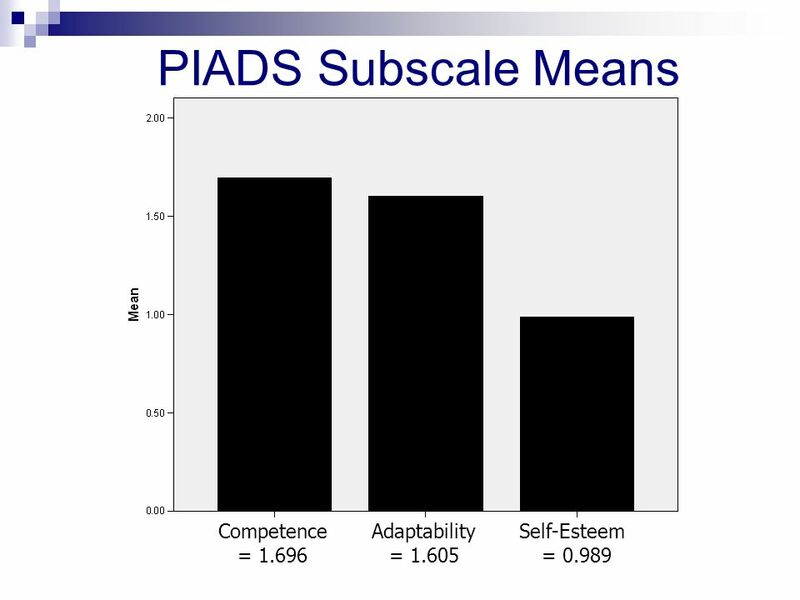 The Psychosocial Impact of Assistive Devices Scale [Manual]. London: University of Western Ontario. Durrant, J. E., Cunningham, C. E., & Voelker, S. (1990). Academic, social, and general self-concepts of behavioral subgroups of learning disabled children. Journal of Educational Psychology, 82, 657-663. Elbaum, B., & Vaughn, S. (2003). Self-concept and students with learning disabilities. In H.L. Swanson, K. R. Harris, & S. Graham (Eds.). Handbook of Learning Disabilities (pp. 229 – 241). New York: The Guilford Press. Fasting, R. B., & Halaas Lyster, S. (2005). 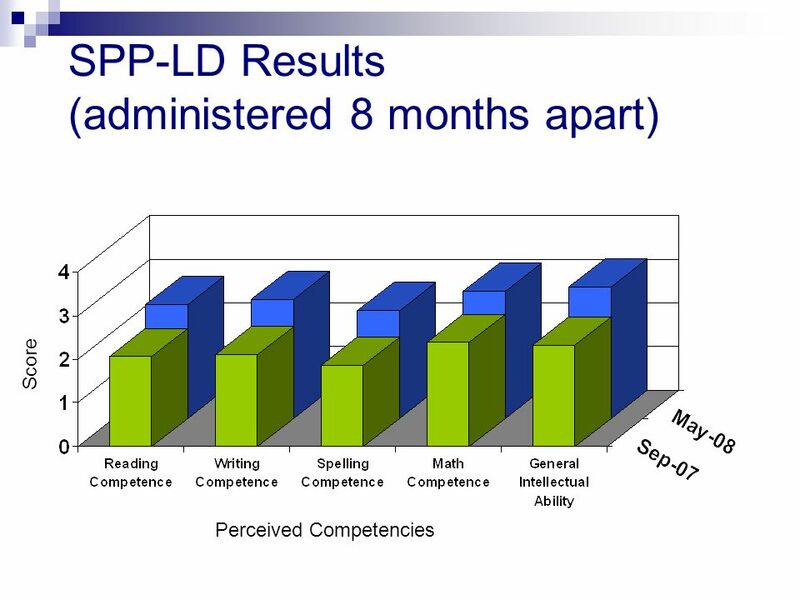 The effects of computer technology in assisting the development of literacy in young struggling readers and spellers. European Journal of Special Needs Education, 20(1), 21-40. Forgrave, K. A. (2002). Assistive technology: Empowering students with learning disabilities. The Clearing House, 75(3), 122-126. Hall, T. E., Hughes, C. A., & Filbert, M. (2000). Computer assisted instruction in reading for students with learning disabilities: A research synthesis. Education and Treatment of Children, 23(2), 173-193. Hetzroni, O. E., & Shrieber, B. (2004). Word processing as an assistive technology tool for enhancing academic outcomes of students with writing disabilities in the general classroom. Journal of Learning Disabilities, 37(2), 143-154. Humphrey, N. (2002). Teacher and pupil ratings of self-esteem in developmental dyslexia. British Journal of Special Education, 29(1), 29-36. 50 References Kloomok, S., & Cosden, M. (1994). Self-concept in children with learning disabilities: The relationship between global self-concept, academic discounting, nonacademic self-concept, and perceived social support. Learning Disability Quarterly, 17, 140-153. Lange, A. A., McPhillips, M., Mulhern, G., & Wylie, J. (2006). 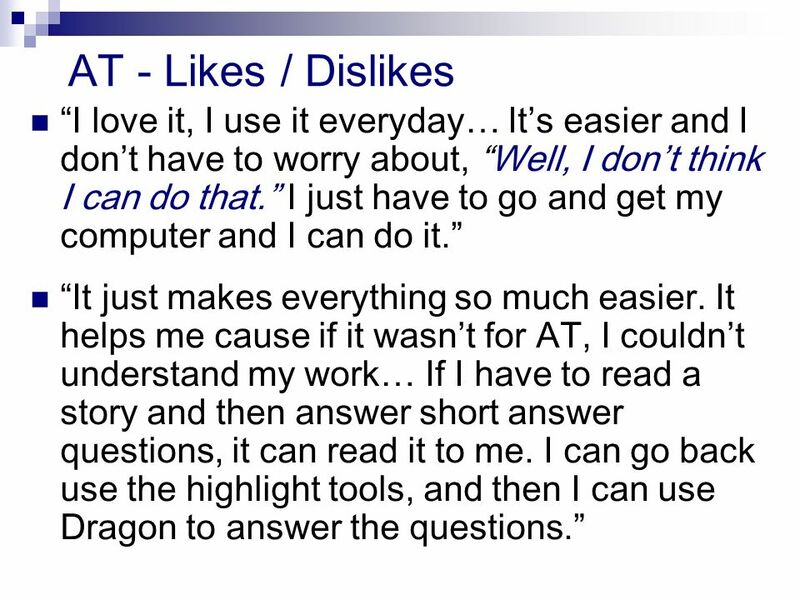 Assistive software tools for secondary-level students with literacy difficulties. 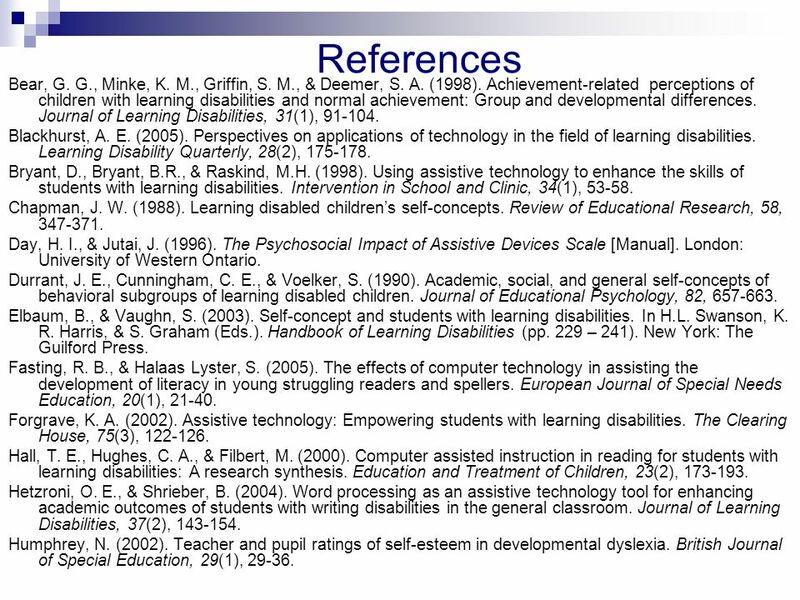 Journal of Special Education Technology, 21(3), 13-22. MacArthur, C.A. (2000). 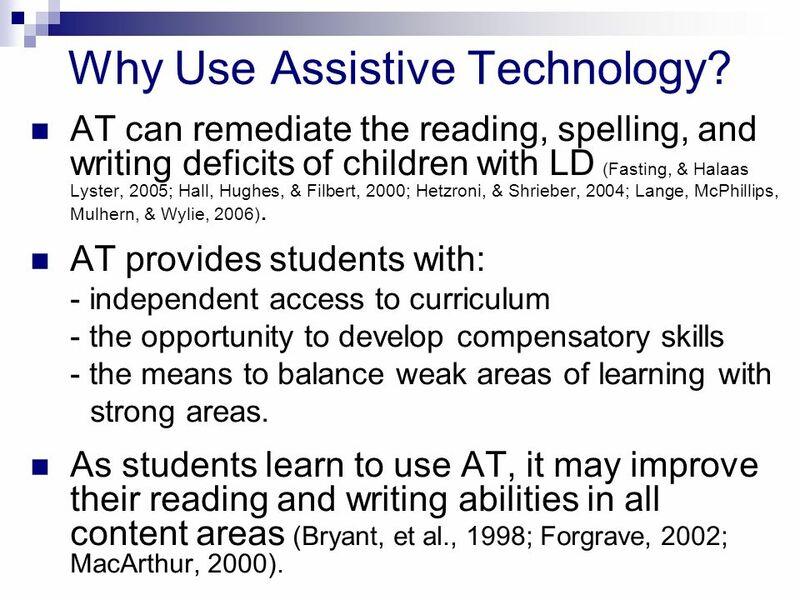 New tools for writing: Assistive technology for students with writing difficulties. Topics in Language Disorders, 20(4), 85-100. Martin, A. J. (2009). The Motivation and Engagement Scale (9th Edition). Sydney, Australia: Lifelong Achievement Group (www.lifelongachievement.com).www.lifelongachievement.com McNulty, M.A. (2003). Dyslexia and the life course. Journal of Learning Disabilities, 36(4), 363-381. Raviv, D., & Stone, C. A. (1991). Individual differences in the self-image of adolescents with learning disabilities: The roles of severity, time of diagnosis, and parental perceptions. Journal of Learning Disabilities, 24, 602-611, 629. Reed, P. & Bowser, G. (2005). 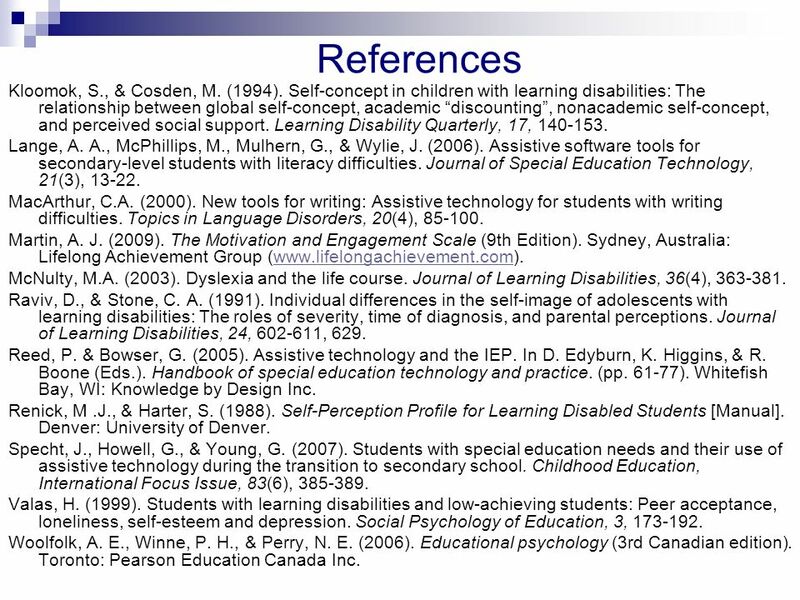 Assistive technology and the IEP. In D. Edyburn, K. Higgins, & R. Boone (Eds.). Handbook of special education technology and practice. (pp. 61-77). Whitefish Bay, WI: Knowledge by Design Inc. Renick, M.J., & Harter, S. (1988). Self-Perception Profile for Learning Disabled Students [Manual]. Denver: University of Denver. Specht, J., Howell, G., & Young, G. (2007). Students with special education needs and their use of assistive technology during the transition to secondary school. Childhood Education, International Focus Issue, 83(6), 385-389. Valas, H. (1999). Students with learning disabilities and low-achieving students: Peer acceptance, loneliness, self-esteem and depression. Social Psychology of Education, 3, 173-192. Woolfolk, A. E., Winne, P. H., & Perry, N. E. (2006). Educational psychology (3rd Canadian edition). 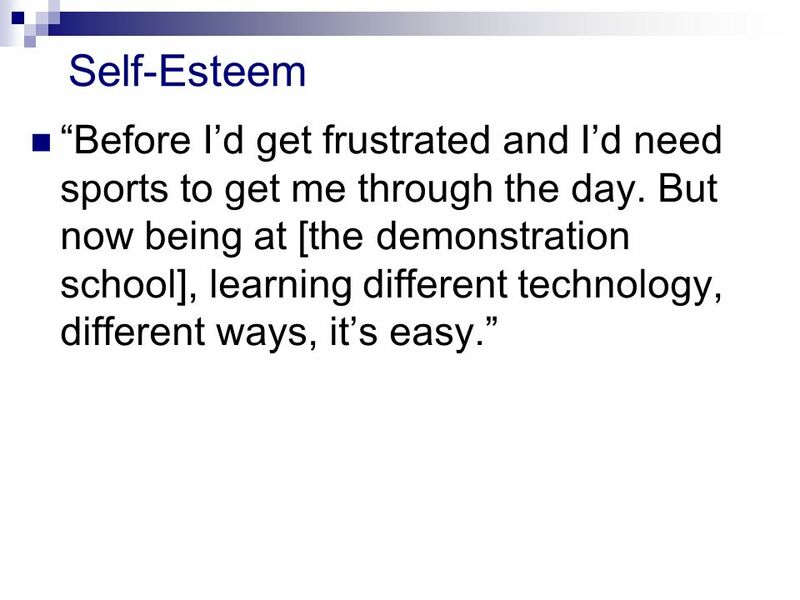 Toronto: Pearson Education Canada Inc.
Download ppt "Assistive technology: Its impact on self- concept and motivation across school transitions. Gabrielle Young & Jacqueline Specht The University of Western." Help, I dont like science and I have to teach it! Sally Creel Early Childhood Ed.D. Cohort Kennesaw State University May 3, 2008. ABSRACT Self-concept and theory of mind abilities of adolescents with Aspergers syndrome (AS) were assessed compared to students with specific learning. Ann Marie Morreale October 27, 2009 When the manual doesnt fit the learner what should teachers do to reach students? Teachers need to be keen observers. Community Involvement of Young Adults with Intellectual Disabilities: Inclusion in Work, Recreation, and Leisure Activities Sarah A. Hall, Ph.D. Ashland. University Students with a Disability: The Transition to Inclusion Jennifer Gillies, BA, MA (Waterloo) MA Critical Disabilities Studies York University. Marta Chwalka Education Table of Contents : Introduction: Statement of the Problem Review of Literature Statement of the Hypothesis. Research teaching Center for Engineering Learning and Teaching University of Washington August 2006 ACI Committee. Specific Learning Disabilities LD—Learns Differently! Dickey LaMoure Special Education Unit. Assistive Technology for Students with Learning Disabilities: Relevant Research and Practical Strategies LDANL Spring Conference on Learning Disabilities. Masoumeh Kafshgarsouteh 1, Dara Tafazoli 2, Tahereh Jalili 3, Ghazaleh Jafari 4 1,3,4 Islamic Azad University –Science & Research Branch (IRAN) 2 University.